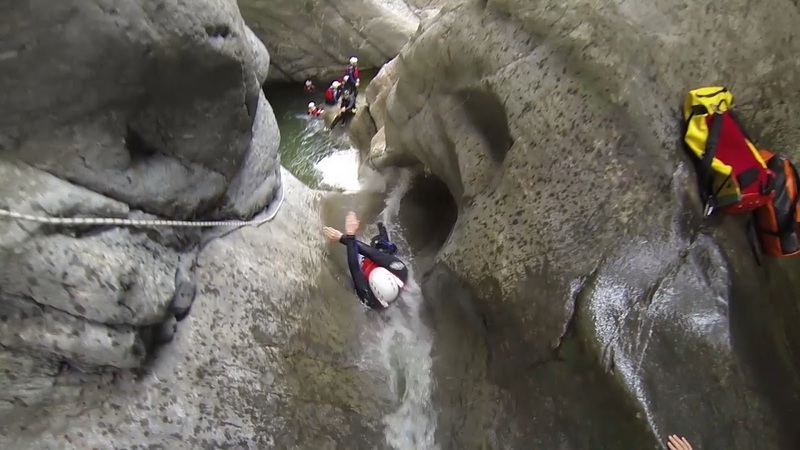 Canyoning… we love it! 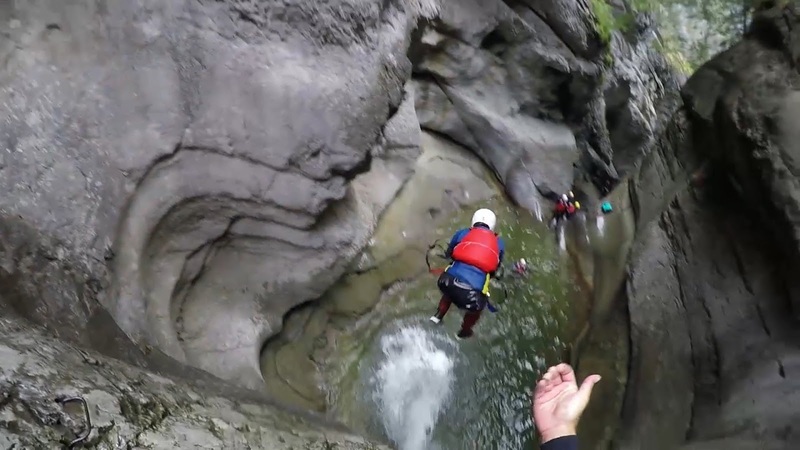 Jumping off cliffs into rivers, sliding down the most amazing natural slides or rappelling down immense waterfalls, it’s something we can’t get enough of. 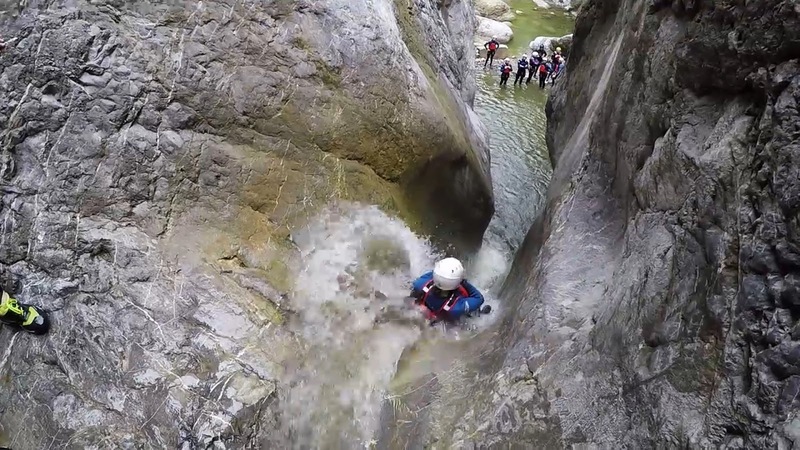 But where do fans of canyoning head to, Chli Schliere of course! 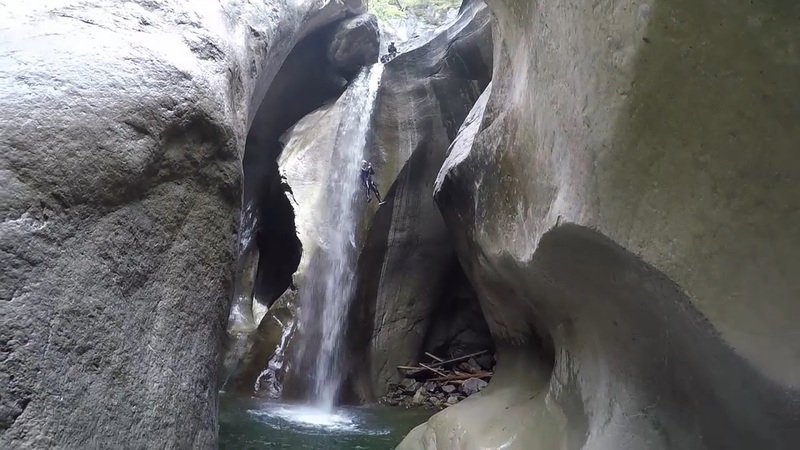 Ever since our first taste of canyoning we have had this amazing place on our bucket list! 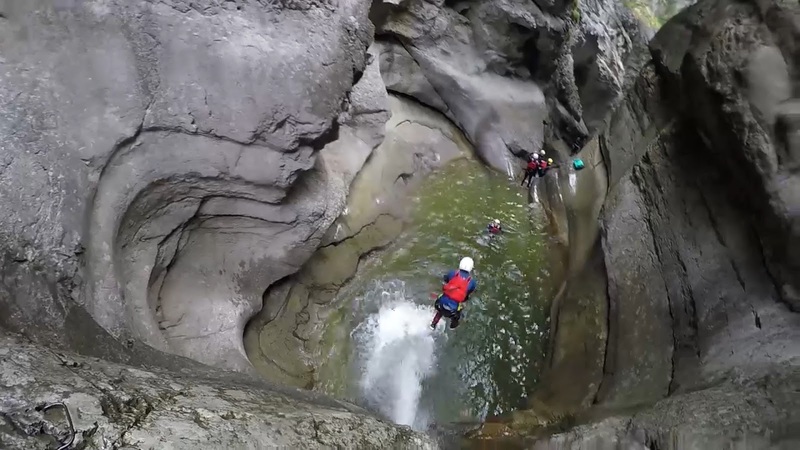 It’s the ultimate canyon! 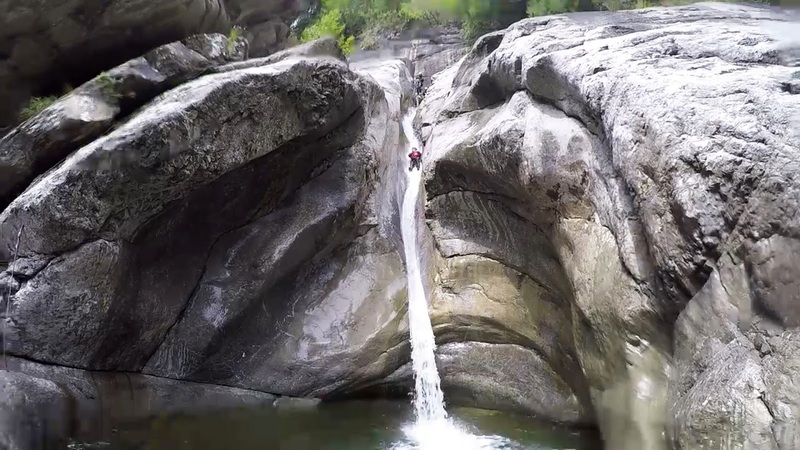 33ft jumps, 50ft rappels and crazy fast and twisted slides…here’s our epic adventure! 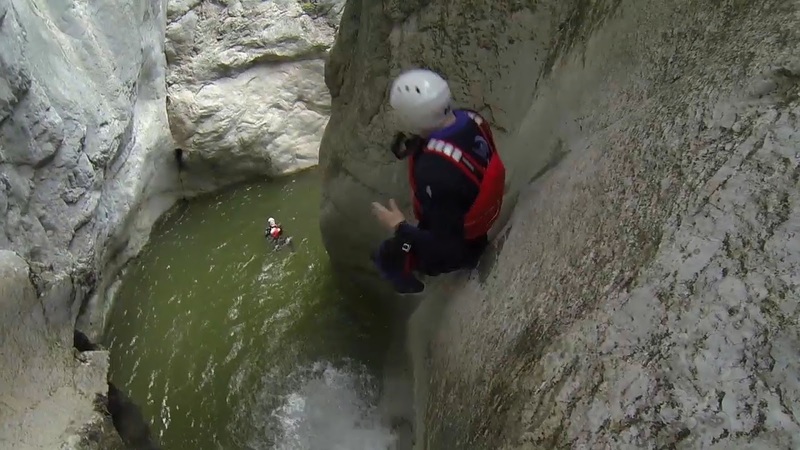 BUT, canyoning is not something which you should go into without knowledge of the canyon, the weather and the surroundings. 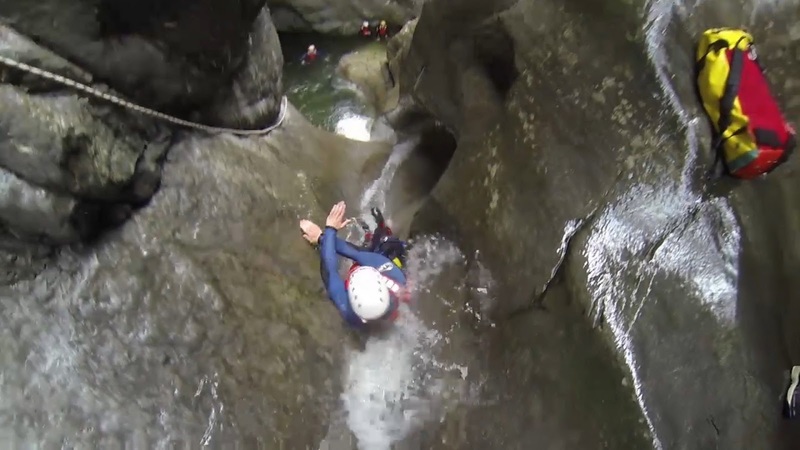 So we booked this trip using OUTDOOR INTERLAKEN, who have one of the best and most experienced teams out there! They provide transport, all the gear and even a video service too! The guides are all super professional but yet friendly, laid back and easy to chat to! What I also love about Interlaken itself (where we were based for this trip) is just how easy it is to book their adventures. 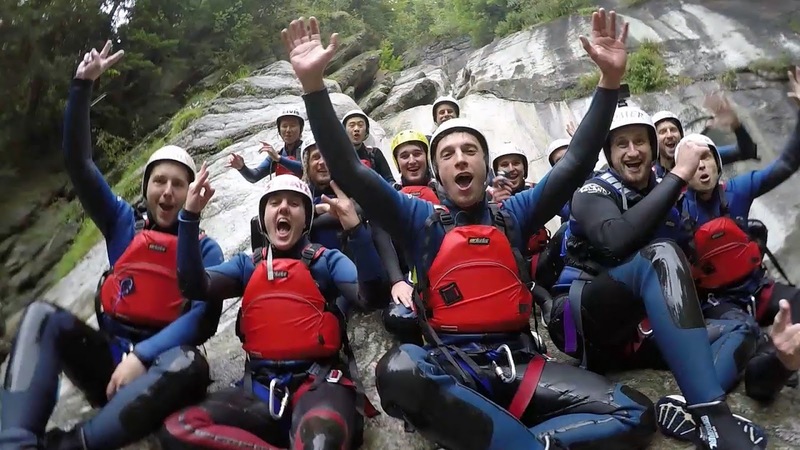 No sooner had we arrived and we had walked over to the Outdoor Interlaken hut and booked ourselves onto the Canyoning and White Water Rafting trips, not only that but we booked to go Paragliding the night before! 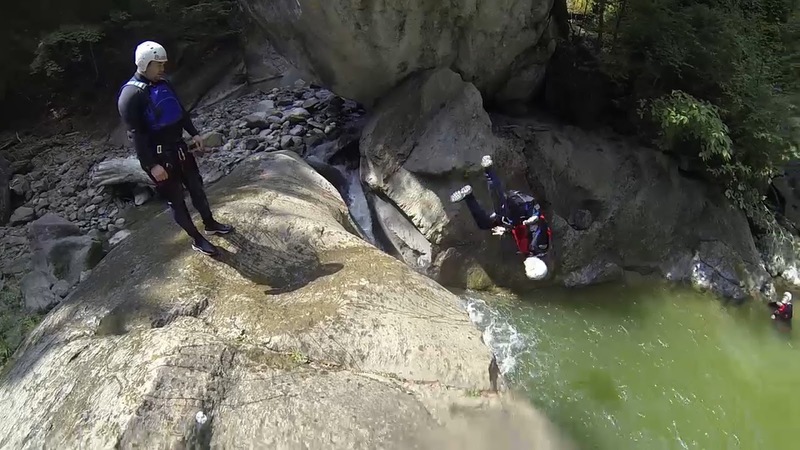 If you want adventure, Interlaken really is the place! As with the Paragliding it isn’t the cheapest, but Switzerland is quite expensive as it is and for the prices in Interlaken it is pretty standard. For us these “big bucket list” things are worth the expense and instead we cut back on the fondues and fancy meals out! 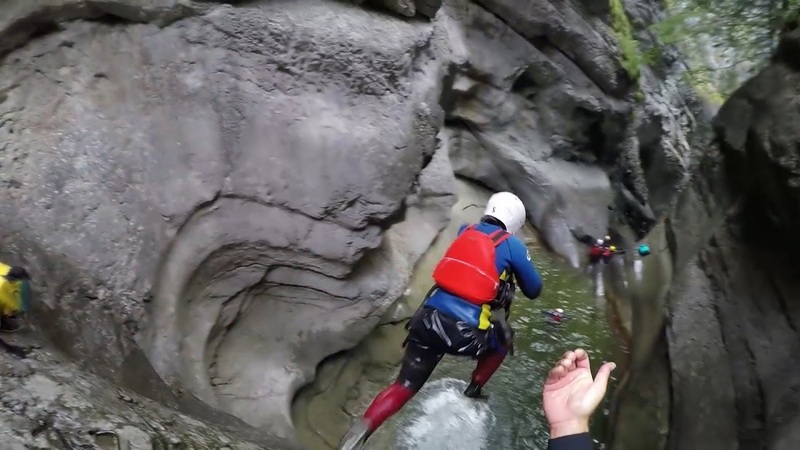 This canyon is suitable for “adventurous athletic people”, and although it is recommend you are able to swim it’s not actually necessary! 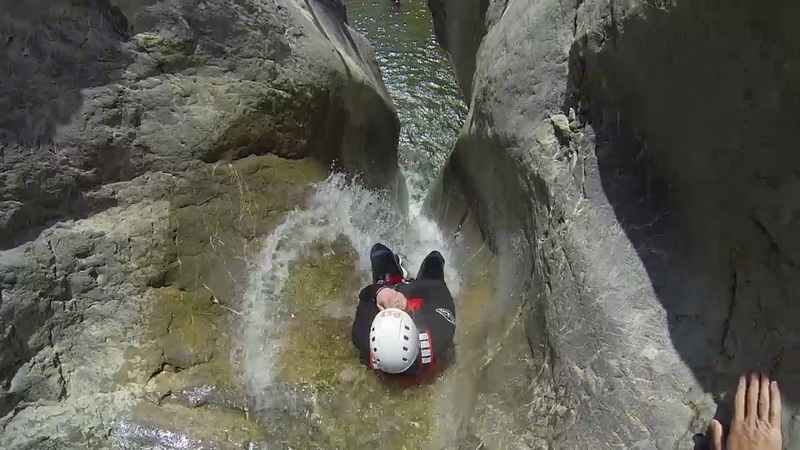 There are also other options for the those wanting a canyoning adventure who are maybe still finding their feet and want something exciting still but might find Chli Schliere a little too much. 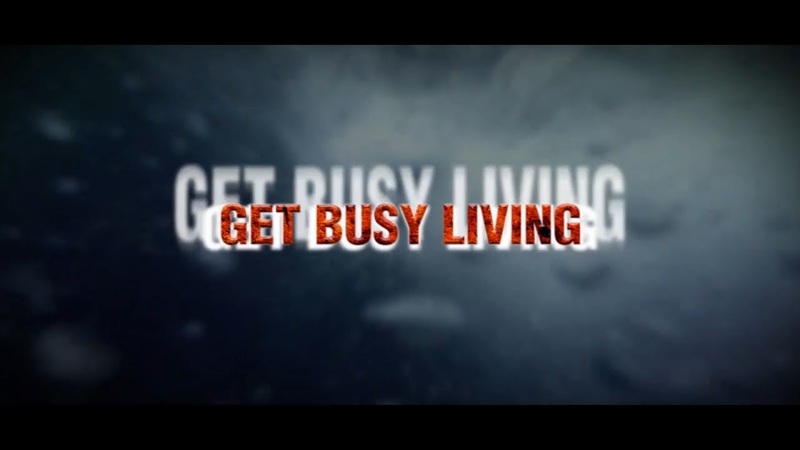 Use the Discount Code GETBUSYLIVING & Get 5% off Adventure Activities! This was a full on experience, I mean, I have had epic days out in the mountains before, hours clinging onto a rock face whilst being beaten by the wind and rain…but this tops them all. 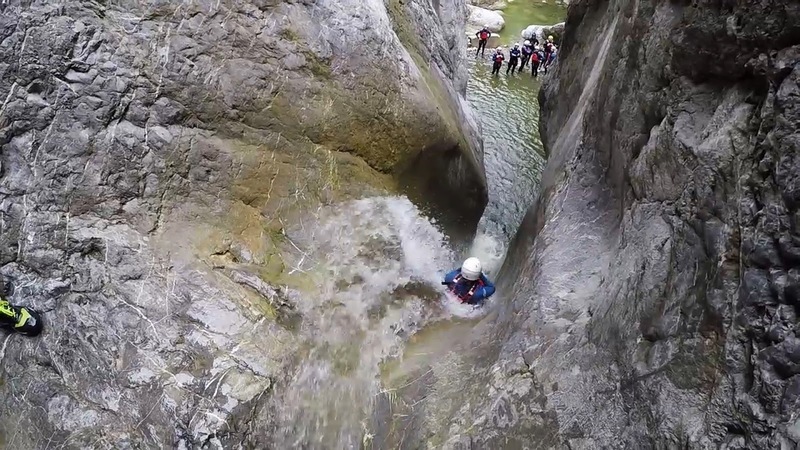 A full day of canyoning, of jumping, sliding, rappelling and even just scrambling through the amazing canyon carved apart by this unrelenting mountain river. I can tell you now that this is something we will never forget, and we have some epic adventures in the planning too! However, the day started off with some trepidation, not because we were nervous but because of the storm that had kept us awake all night as it blasted the window of our hostel dorm. My heart sank as the rain poured down and I realised that this could be our last opportunity to make this dream a reality! We had decided a few days earlier that we would meet the group at Alpnach as we had our own car and wanted to head over to the beautiful little city of Lucerne afterwards. The van carrying the rest of the group turned up and as the instructors jumped out the rain began to fall again…oh no! Now as much as I didn’t want the trip to be cancelled, we also didn’t want to die either! 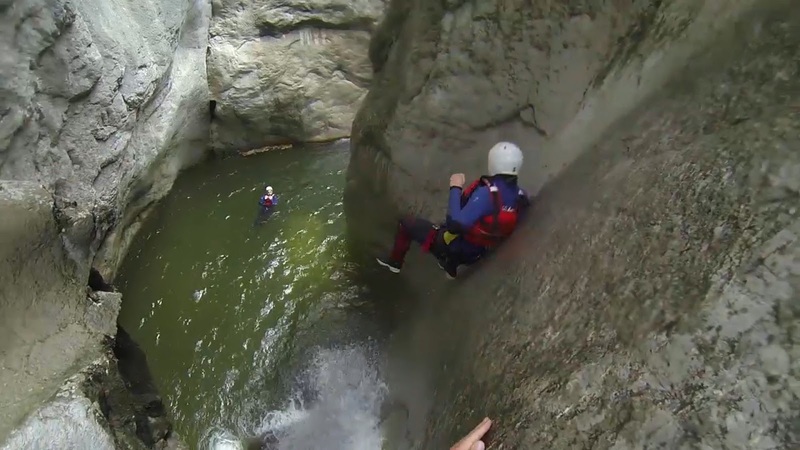 Joking aside canyons are dangerous places and flash floods do happen, so we were truly at the mercy of our guides here to make the right call. I was really impressed with the guides I have to say. They could quite easily have cancelled at the first sight of rain and all gone home for the day. Our guides however knew the canyon well enough to be able to assess the potential risks, not only that but they also predicted the weather for the rest of the day perfectly, pretty reassuring! Now I was excited! A hours drive through the mountains lay ahead of us and as with all of Switzerland it wasn’t just a boring haul up there but a stunning journey through breath taking scenery! Now, to get back down…well there is really only one way, follow the water! Chli Schliere doesn’t allow you to ease into it, oh no! Straight from the off you are down a fast slide before being confronted with the biggest jump of the day: 10m/ 33ft straight down and over a waterfall. This was the one I was most excited about but also a little nervous to! 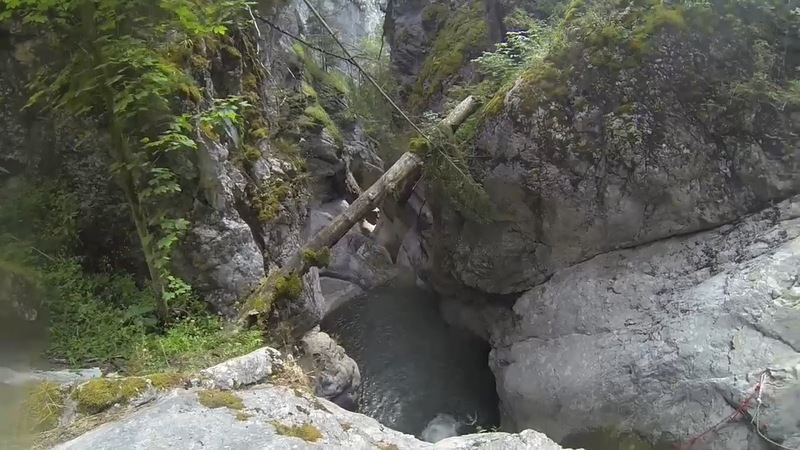 I know when we did the Esk back in April we had built up over the day to do the biggest jump of 23ft! This was a whole 10ft higher!! 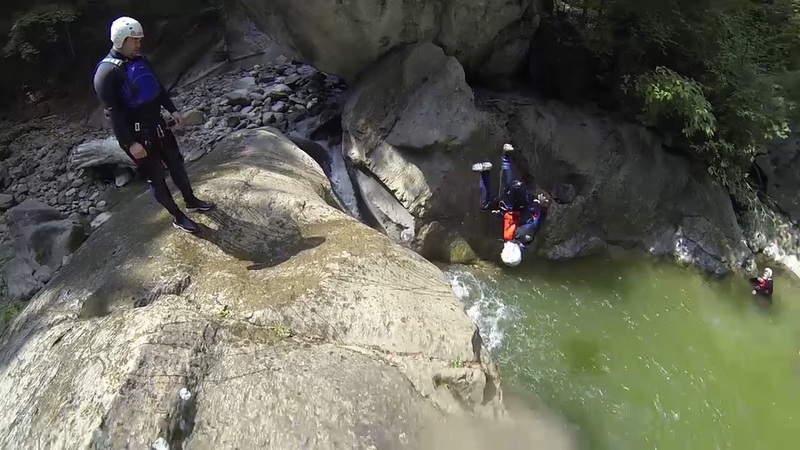 Just jump I thought to myself, first time just go! He landed in the water below and I knew I had to do it! My heart was racing as I stepped up, placed my right foot onto the guide’s and he gave me the thumbs up… here it was, now or never! But my nerve held, I took a deep breath and just went for it! What a rush! As I came to the surface of the murky waters below I felt that hit of adrenaline surge through my body…and a hint of relief! 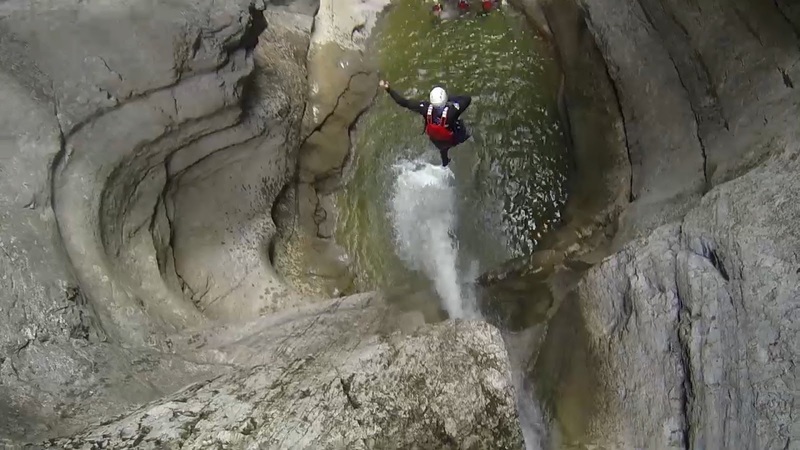 Now I had conquered the big jump I knew I would take the rest of the challenges the canyon threw at us in my stride! I was buzzing! Now we were right in the belly of the canyon, no way out but the follow the water as it twists and carves it’s way though this magnificent passage way. Part of the enjoyment for us was even just the wading, walking and swimming through this place many never get to see. Nature really is an amazing thing and nowhere else is it more visible than in Switzerland! On we pressed, now well acclimatised to the waters we were surrounded by and loving every minute! Now came “The Corksrew”, a twisted slide which would throw you about and spit you out at the bottom. Here you had to make sure and raise up your arms to stop your head bashing off the sides of the slide! 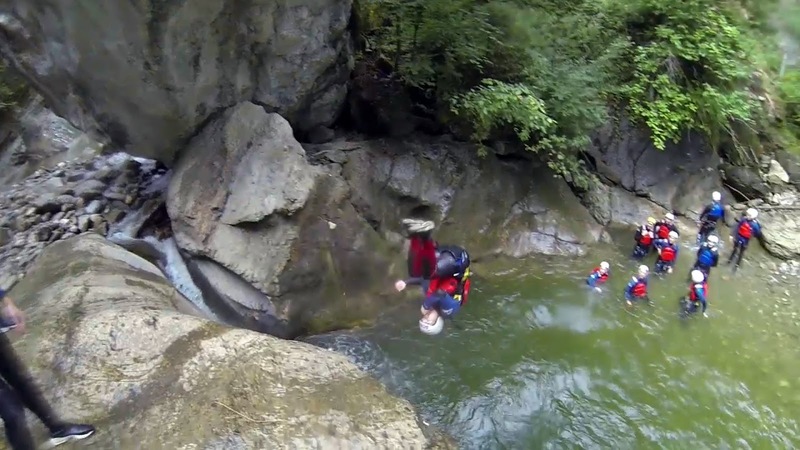 Sure the guides told you what to do, but it was your responsibility to do it! 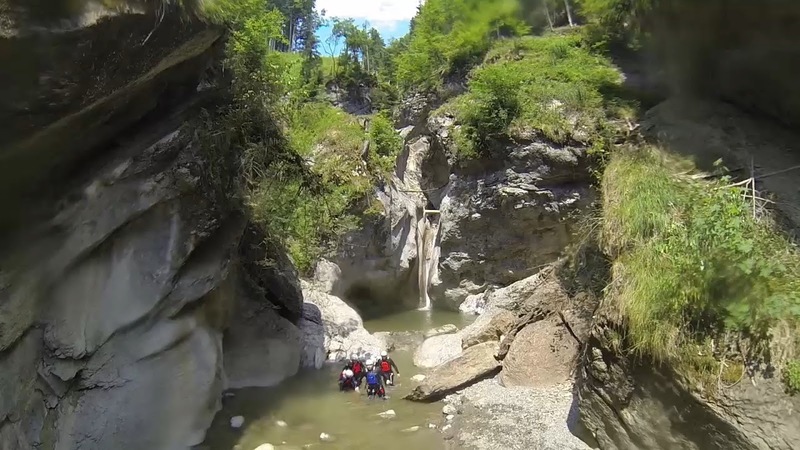 This was no Disneyland ride, it was fast, harsh and unforgiving nature…and we loved it! After a few more smaller jumps and slides (still well over 20ft some of them!) we arrived at another jump I had been itching to do…the jump and slide! This was a big one, the drop itself at least the height of the big jump we did earlier but this time instead of going straight down we hurled ourselves towards the canyon wall!! 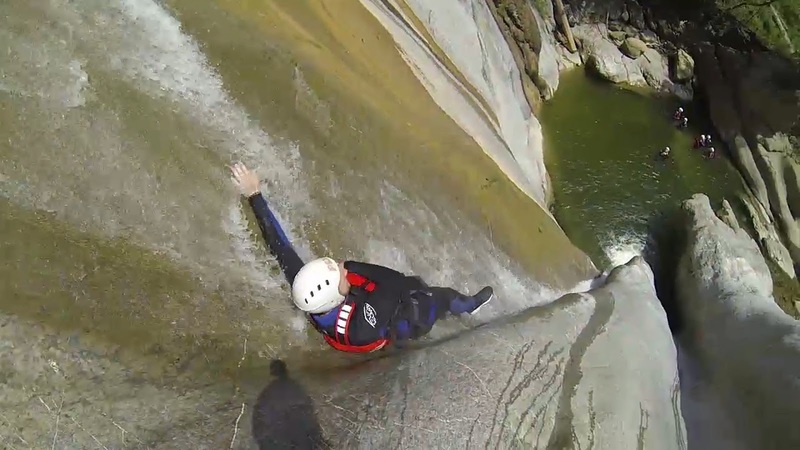 No this wasn’t a mistake, but instead as we jumped we would spin around and land with our back on the wall and slide down, at some considerable speed, towards the unforgiving water below! I was a little nervous for this one as it required an amount of accuracy and judgment the others did not! But again I gathered all my focus and went for it…although I did land in the seated position which left a bit of a sting, it was a real buzz! 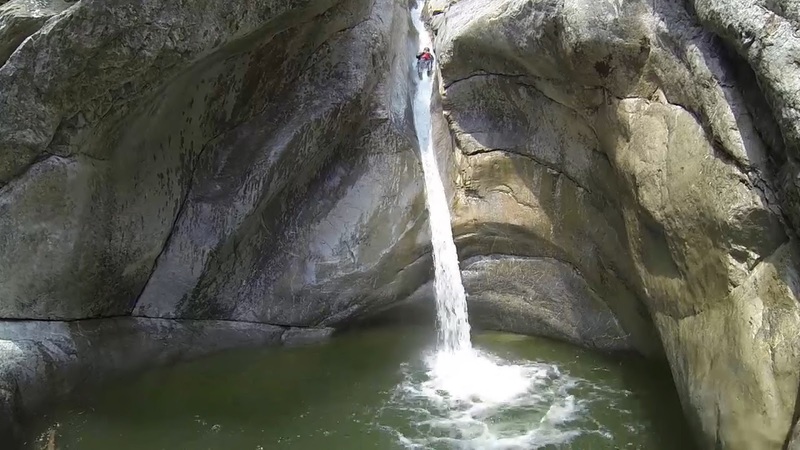 Next up was the 50ft rappel down a powerful waterfall. 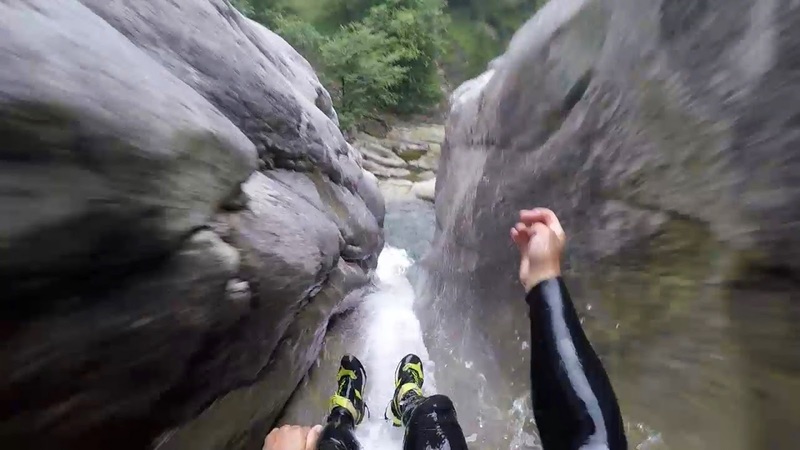 At first you get harnessed up and off you slide down a some what tame looking slide, only for the cliff edge to drop away dramatically and leave you hanging in the wake of the waterfall! 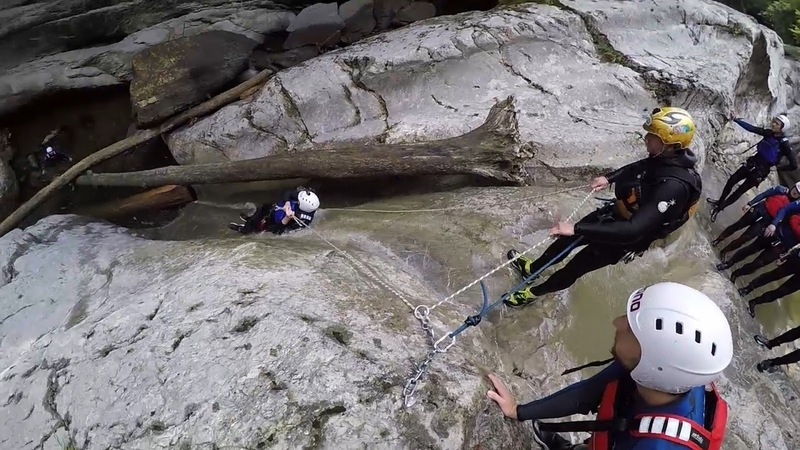 Even though we are well rehearsed in hanging off ropes at height, you can’t help but get a rush off such an amazing rappel is such epic surroundings! Further along the canyon came the vertical slide and most likely the source of my whiplash the morning after! (don’t stick your head up kids!) Vertical really doesn’t do the angle of this beast justice, it’s like the most extreme kamikaze slide you have ever seen, but all natural! How amazing is that! 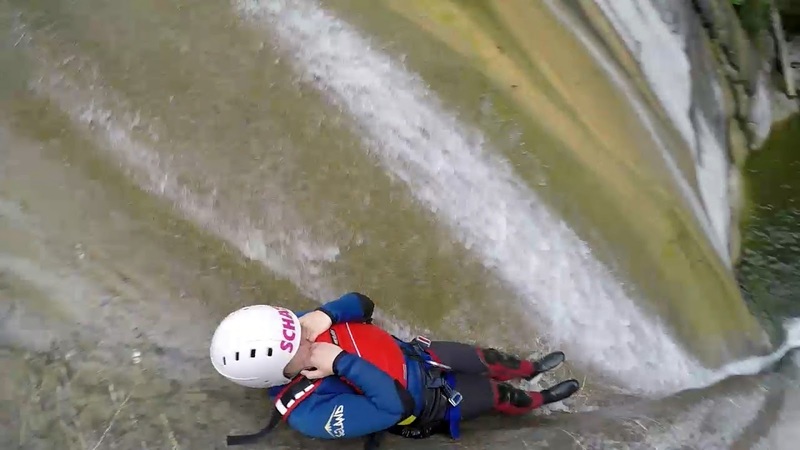 After gently pushing yourself off the slide you pretty much take off as you hurtle towards the water at high speed and the walls around you become narrower and narrower! Now for the really cool bit: The freestyle pool! Still a good 15ft high what was called for here was a front flip! After somehow finding ourselves now at the back of the group we watched as everyone else took their turns, one unfortunate lad being a little overzealous after his mates had all landed on their backs, he over rotated and landed smack on his face…ouch! No backing down now though, it was our turn! But as a one time gymnast I busted out the front flip with style! Shorty on the other hand, well he did one but what is going on with his hands I will never know! Good effort all round though on what was a pretty intimidating jump for a flip! Next up was one of the most brutal sections, the shot gun slide! We would have to hold tightly onto the rope as we lowered ourselves down a precarious and wickedly fast slide. After positioning ourselves into the “gun barrel” at the sound of a whistle we would let go of the rope! Sliding through our carabiners off the rope we would then hurtle down the remainder of the steep slide before dropping another 20ft into the pool below! Pretty amazing stuff, and also the need to keep yourself tight as you enter the water at up to 70kph!! Straight after this is another huge slide, this time it starts open and you just step across into it before it narrows as you come closer to the water! What an amazing experience to have explored this canyon with such a group of approachable and interesting guides! After that it wasn’t over, there was even more slides; three in one, one where we went down backwards and then some tied into the rope, again holding it ourselves and being in control of our own safety. Another cool section was were we got lowered down so far and then dropped into the water! As well as a few more jumps thrown into the mix! The whole thing was so much more intense and amazing than words, pictures or moving images can ever describe. Even just being in the canyon was unforgettable! These are the days we live for, the adventures, the times when you truly feel alive and not just existing. 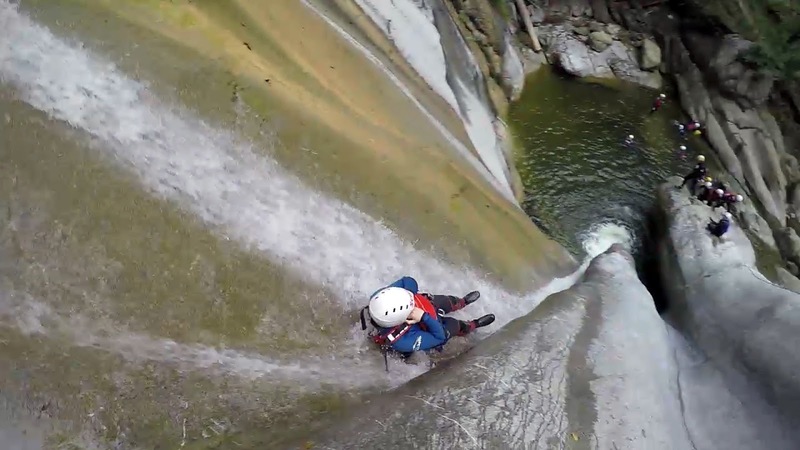 To feel the rush of adrenaline and get up close and personal with the power and beauty of nature. If you can try to book a few days before but maybe not as early as we did so you can check the weather first. If you are sure of a good day then take it for this activity! The shoes you are provided with are big for the size. If you meet up at the hut before you try them on and they take them with you, otherwise you get what size you write down! if you have a pair of wet socks they will likely fit your normal shoe size well and be more comfortable! if not, go at least a size maybe two lower! Be confident! Go into it with a positive attitude and just go for it and you will have the most fun you ever have! 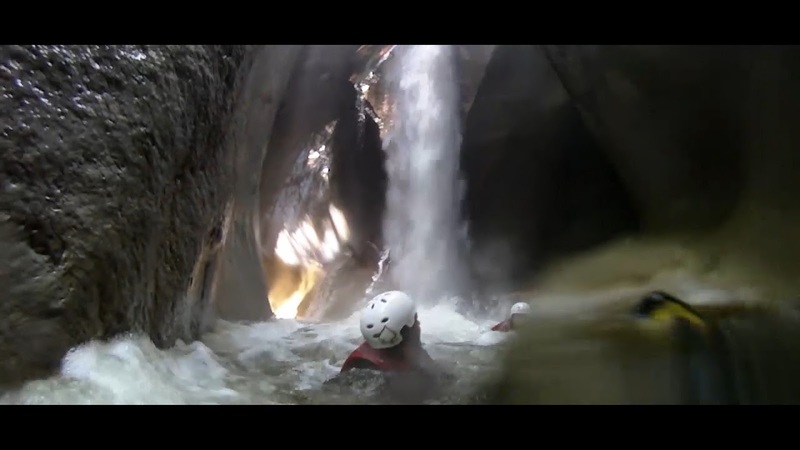 have you ever been canyoning or visited Interlaken? 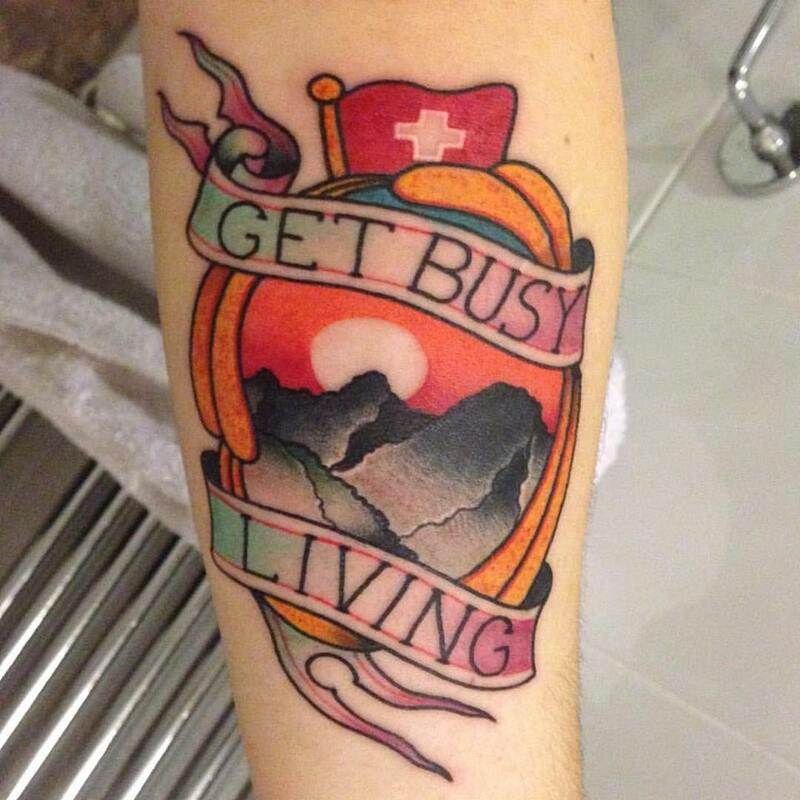 When we got home we ended up getting tattoos to memorise this trip of a lifetime! 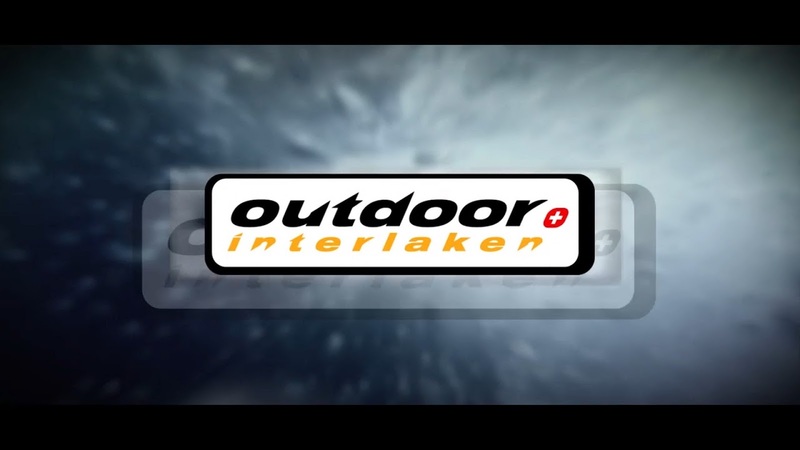 Disclaimer: This post was sponsored by Outdoor Interlaken. As always, all opinions are our own! 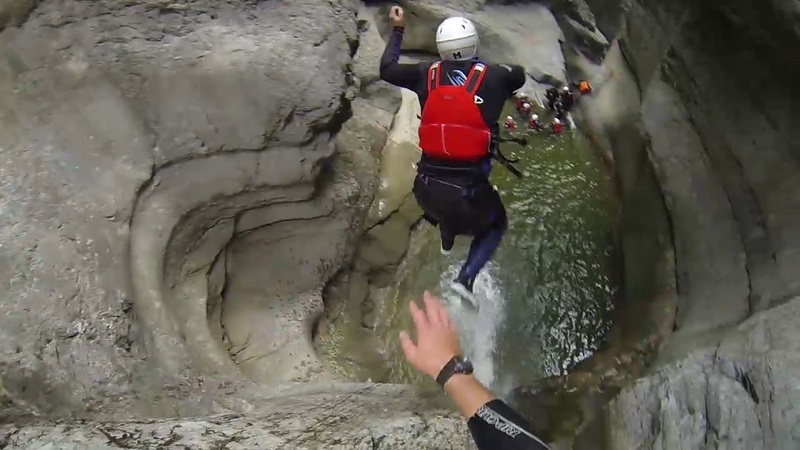 Bookmark this article Canyoning in the epic Chli Schliere, SWITZERLAND!